Wirebound weekly planner features a two-piece leatherette cover and academic format. Planning pages range 13 months from August to August. Two-page-per-week spreads include unruled daily entries, count of days and days remaining, Monday through Sunday scheduling, and past, current and two future months reference. Monthly planning section offers two-page-per-month calendars from August to August. Each monthly spread has unruled daily blocks and Sunday through Saturday scheduling. 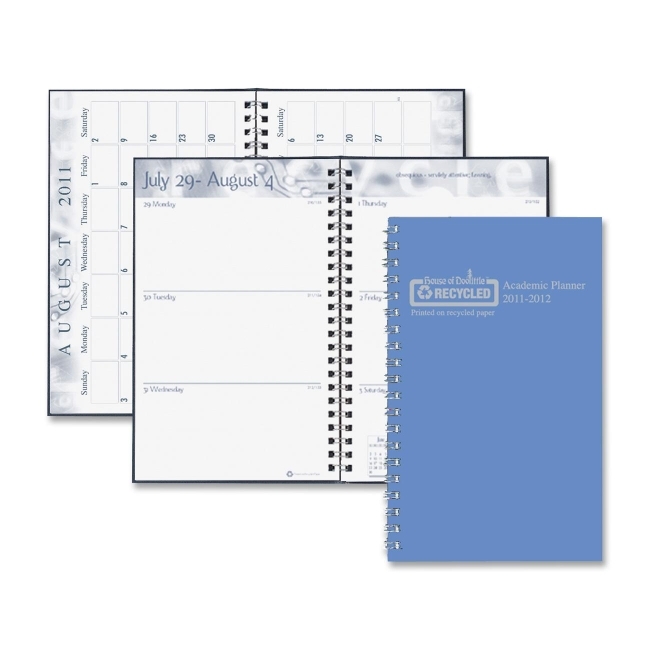 Planner is printed with soy ink on paper made of 100 percent post-consumer fiber.